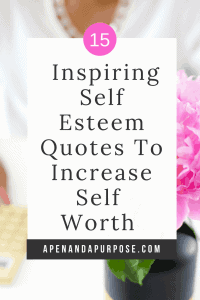 Self esteem quotes help to inspire you to go into your day focused on your strengths rather than weaknesses. Adding meaningful self esteem quotes to your bullet journal ensures you will see the quotes at least once per day. I’m a huge believer in going into each day with intention for the day. I like to know what I intend to accomplish and who I want to be each day. Reading inspiring quotes about self confidence and self worth can boost self esteem going into each day. There are times when life gets hard and you feel a bit beaten up, which can make it hard to go into a day with a positive attitude. The worst is when things are happening in your life that lead you to feeling less confident in your abilities. It’s easy for negative beliefs to take over. Challenging those beliefs is important once they take over, but is there a way to pep yourself up prior to that happening? I like to go into a stressful day with armor, relying on my personal strengths to get through anything difficult coming my way. I once had a job where I felt overwhelmed and beaten down every day. During that time, I found bracelets with encouraging statements on them that were incredibly helpful. I thought of them as my superhero powers. Each morning I chose the bracelets I needed to give me a better day. I loved that I saw the bracelets throughout the day and they gave me little reminders of my strength and encouraged me to keep going. 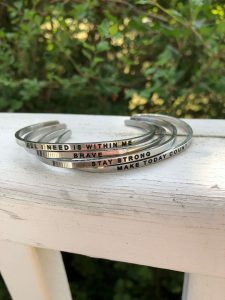 Click here to purchase the bracelets and use my code APENANDAPURPOSE for 10% discount! In addition to the bracelets, I also had a playlist on my Amazon Music I created to listen to on the way to work to set the intention. A printable list of those songs is in my resource library. Sign up at the end of the post to download your copy. Before going into the quotes, I want to share this video with you that will help you see how you can impact others without even knowing it! Adding quotes about self worth and self confidence to your bullet journal is another way to create super powers to get you through a rough day. I like adding things like this to my bullet journal because I look through it at least once a day and having a page of meaningful quotes is helpful to me. I found fifteen inspiring self esteem quotes to share with you to put into your bullet journal. Pin to your Pinterest Boards to save for later!